I was thinking of a way to start off this post all weekend. I was going to mention how I’ve done all these great things and how this past weekend was one of them, but after re-considering it all, I’ve decided to keep it simple: this past weekend was the best weekend of my life. The 14-hour bus ride from Columbia, Missouri to Columbia, South Carolina. Getting pulled over at 1:15am because our taillight was out. 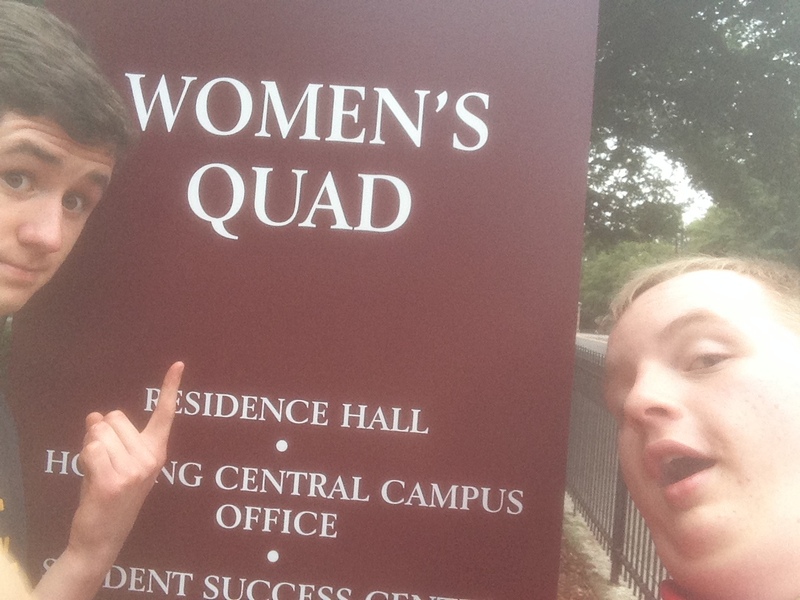 Racing over with my buddy Tyler Murry to the horseshoe on South Carolina’s campus to see Kirk Herbstreit talk. Having one of the best burgers I’ve ever had at a place called Pawleys. Walking all across campus, just taking in the entire atmosphere. Waking up the next morning and heading over to ESPN’s “College Gameday” and getting photos with Herbstreit, Tom Rinaldi, and Lee Corso. Having some good ol’ BBQ for lunch before heading over to Williams-Brice Stadium for the football game. Being on the field when the Carolina fans are going crazy to “Sandstorm.” Seeing Missouri come back from 13 points to shock the Gamecocks. Finally capping it all off with another 14 hour bus ride back to CoMo. Yeah, the weekend was pretty good. So many great things happened this weekend, and I’m glad I was able to share them with a guy like Tyler. We’ve met through our work at MUTV, and being an exec with him this year has been awesome. He’s also a very good guy, which made the weekend that much better. But enough with the sappiness, time to talk about it all! Thursday night was pretty chaotic, but once we finally got on the bus with the cheerleaders, it was smooth sailing. That is, until about 1:15am, when an Illinois police officer pulled us over because our taillight was out. The best part about it is that the cop didn’t even give us a ticket. We basically were pulled over for nothing. And everyone in the front of the bus was woken up from it from the cop’s annoying flashlight. Once we arrived in Columbia, though, is when the fun began. The bus dropped us off at the stadium, and from there, Tyler and I had to take a cab over to the horseshoe (South Carolina’s quad) so we could attend this group interview with a variety of ESPN personalities. “College Gameday” was in town, and various media members were able to talk to Kirk Herbstreit, arguably ESPNs best college football analyst. Luckily, Tyler and I made it in just enough time, and we were able to sit in on Herbstreit’s full interview. That was a great experience, although lugging around seven bags to get there wasn’t all that fun. 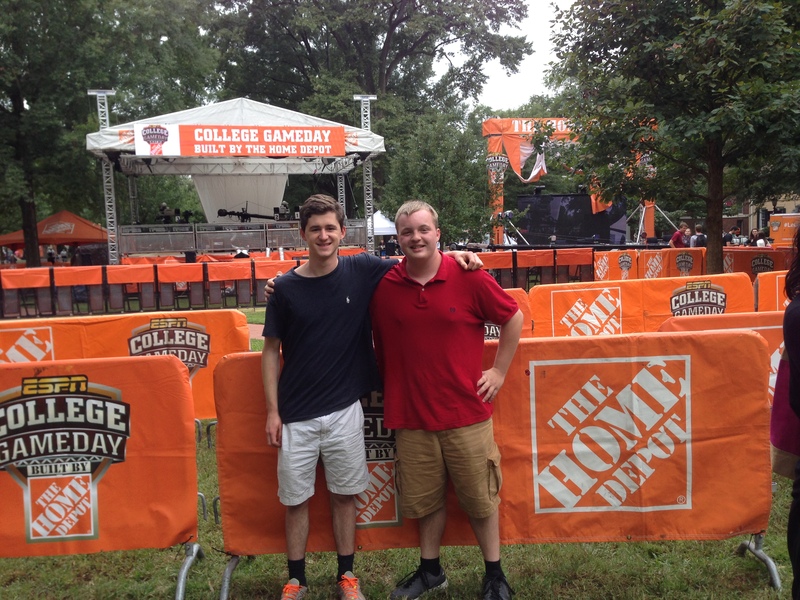 After taking several pictures around the Gameday set, we departed for our hotel. We checked in, relaxed, and then headed out to visit downtown Columbia and campus. 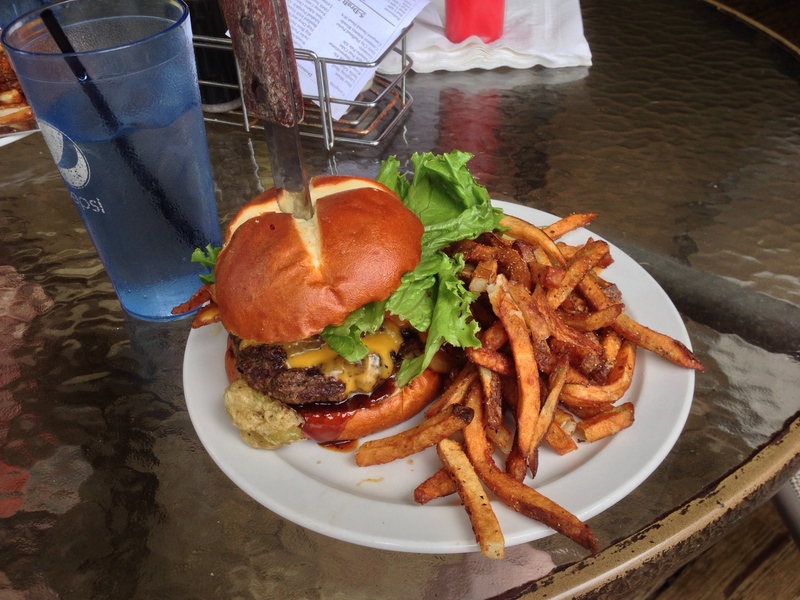 We went to this restaurant called “Pawleys Front Porch,” and man was it good. I had the wadmalaw, which had chipotle barbecue sauce, bacon, cheddar cheese, and fried pickles on a pretzel bun. Yep, fried pickles. Very unusual topping, but it was probably the best burger I’ve ever had. After we filled up, we walked around campus, which I’m pretty sure is the entire city of Columbia. It’s a very spread out campus, but for the most part, is very beautiful. After taking in the campus, we decided to head back to our hotel and call it a night. We had to get up for Gameday. Saturday was probably the best day I’ve had in the journalism business. “College Gameday” is easily one of the coolest sports shows on television, and it’s definitely the marquee show for college sports. Having press access to that was truly a one of a kind experience and it something I’ll never forget. From the fans, to the signs, to the ESPN people, to Kenny Chesney, and everything in between, the entire morning was incredible. 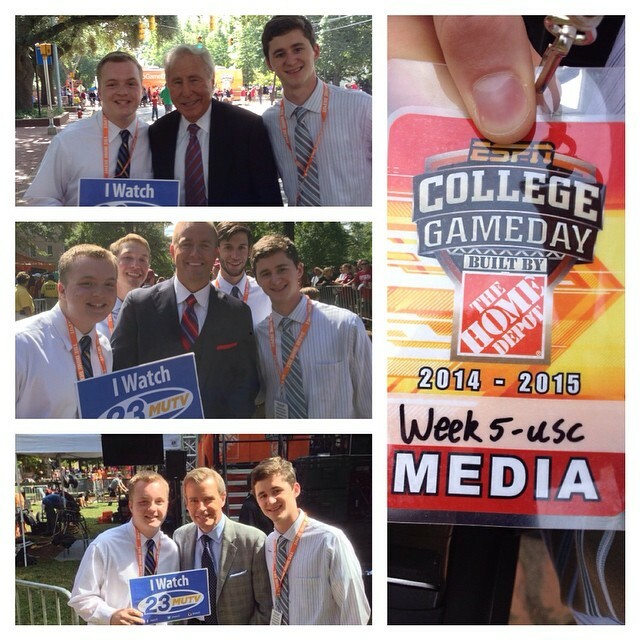 Also, getting photos with Rinaldi, Herbstreit, and Corso was pretty cool. Rinaldi was the nicest about the photos, as he made it a point to shake our hands and ask what our names were. The other two were being rushed out, so even getting a photo of them was pretty improbable. Overall, though, the whole setup was great and being 30 feet away from it all was incredible. Then, after lunch, it was game time. Nothing was cooler then walking in to that stadium that Saturday evening, knowing how important this game was for both teams. Seeing 83,000 people dancing to “Sandstorm” before the game was truly a sight to see. The building was electric, and I was having chills just watching the people go nuts. The game itself was unreal. Missouri winning at the end with a crazy comeback was fitting, and Andrew Bagget’s extra point making the difference made it even that much sweeter. It was just nice to see Mizzou bounce back after a tough loss to Indiana and show that they are indeed a serious contender to win the SEC East. And winning on the road is also nice, too. The bus ride home was great, of course. Lot of celebrating happened before everyone went to bed around 2am. We arrived back in Columbia, Missouri around 1:30pm, and that was it. Overall, not many experiences will live up to what Tyler and I went through this weekend. From taillights, to fried pickles, and to sandstorm, this weekend had it all. I’m just thankful I was able to have such a great experience and the memories I made will live with me forever.